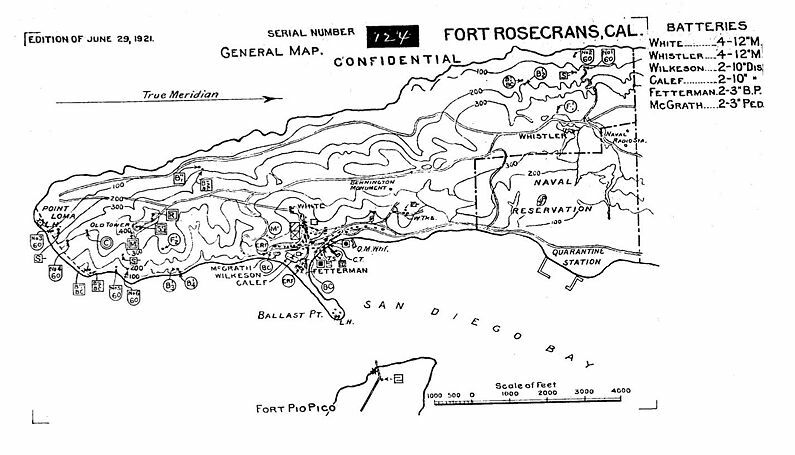 Fort Rosecrans (1852-1959) - Established 26 Feb 1852 as the Fort at Ballast Point and renamed Fort Rosecrans in 1899 after Major General William S. Rosecrans (Cullum 1115). 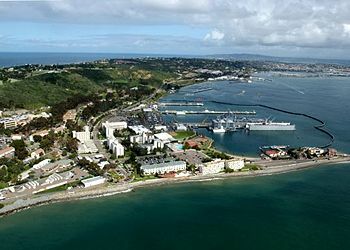 Located on Point Loma in San Diego County, California. The military reservation was declared surplus 31 Dec 1949 and transferred to the U.S. Navy Department 1 Jul 1959. The initial fortifications were planned for Ballast Point about the location of the old Spanish Fort Guijarros but actual construction of earthworks didn't begin until 1873. Plagued by a chronic lack of funds, the first batteries weren't completed until 7 Feb 1898. Part of the Harbor Defense of San Diego. Established to protect the entrance to San Diego Harbor. Four Endicott Period Batteries were constructed beginning in 1897 and two of them remained active through 1942. A harbor mining capability was built and accepted for service on 31 May 1901 that consisted of a mining casemate, a cable tank and a mine storehouse. In 1911 the mining system was upgraded with a casemate addition, a store house, a loading room, a cable tank, a tramway and a wharf. The new system was accepted for service on 15 Feb 1911. Initial post construction was completed in 1904 as a small two company coast artillery fort. 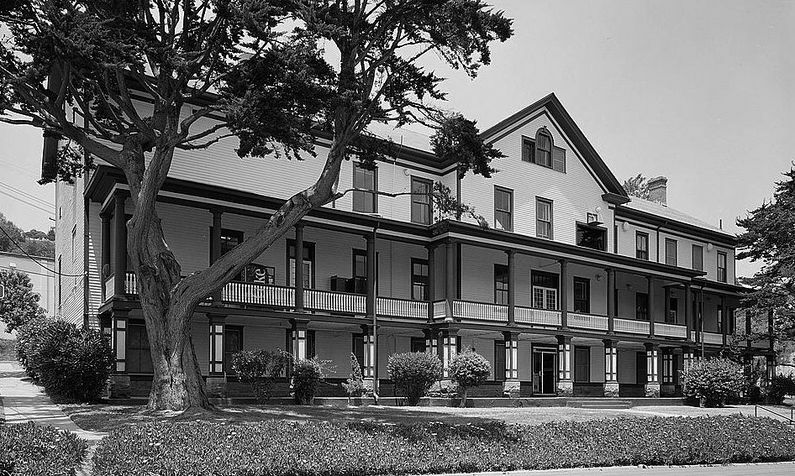 Officers row contained the commanding officer's quarters and four sets of duplex company grade officer quarters. 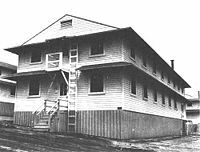 Two 116 man barracks and two sets of duplex NCO quarters housed the enlisted men. A guardhouse, hospital, administration building and various support buildings completed the basic post. A Central Power Plant was accepted for service on 16 Jan 1905. A small expansion took place between 1909 and 1911 with the addition of more NCO quarters, a PX/gym and a morgue. The post was laid out along San Diego bay with the major buildings all in a row facing the bay. The traditional central parade was not possible because of the slope of the land. The gun batteries were all situated to the south of the post buildings. Construction on two Taft Period mortar batteries began just before the United States entered World War I. Battery Whistler was built at the north edge of the reservation while Battery White (2) was built on the western edge. During World War I the 5" guns of Battery McGrath were ordered dismounted for shipment abroad. They were later replaced with the 3" guns from Fort Pio Pico, Battery Meed. After the war, the 3" guns and carriages of Battery Fetterman were ordered scrapped and the battery was abandoned. The post expanded greatly during World War I and many temporary buildings were built. The 1921 plans show some of these buildings still in place. Many of them remained until World War II. In the 1920's, the post was placed in caretaker status and intermittently serviced non-artillery units and National Guard units. In the 1930's, the Work Progress Administration (WPA) established a presence on the post and carried out work including building repairs, road work and even the scrapping of old Battery Fetterman. On 30 Jun 1940, post capacity is listed as 9 married officers, 13 NCOs and 265 enlisted men in permanent quarters. 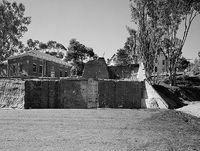 Most of the post buildings were listed as in fair to good condition but one of the barracks was unoccupied. One year later, 30 Jun 1941, the post quarters had expanded to a capacity of 9 married officers, 131 bachelor officers, 14 NCOs, 2,742 enlisted men and 18 nurses. Additional capacity in the form of 528 tents was available. The building program was done in anticipation of thousands of draftees and provided for construction of 40 temporary WWII 63 man barracks, 18 mess halls and numerous support buildings. Three World War II temporary gun batteries and four 1940 program gun batteries were constructed during the war years. Two U.S. Marine Corps practice batteries, Battery Zeilin and Battery Gillespie, were turned over to the U.S. Army after the war began. A Harbor Defense Command Post (HDCP) was constructed in west Fort Rosecrans in 1942 and accepted for service on 12 Oct 1942. This was a concrete underground structure with a corridor leading up to 12-foot by 12-foot observation stations. 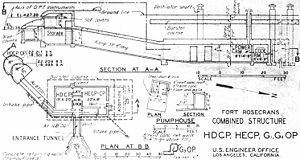 The HDCP occupied a 15' by 20' room and the antiaircraft control center occupied an adjacent 22' by 18' room in the underground facility. 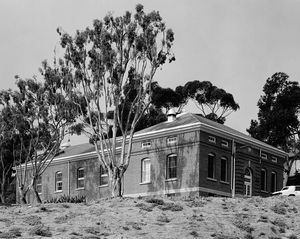 The decision to colocate the Harbor Entrance Control Post (HECP) and the original HDCP was taken and the underground facility was expanded to include a radio room. The military reservation was declared surplus 31 Dec 1949 and transferred to the U.S. Navy Department 1 Jul 1959. Active U.S. Navy military reservation and Cabrillo National Monument. Location: Point Loma, San Diego, San Diego County, California. This page has been accessed 33,299 times. This page was last modified 10:10, 17 March 2019 by Bill Thayer. Based on work by John Stanton.